I arrived at Serendipity’s house looking like a wet rat and feeling like a moron. I shouldn’t have left like that not only because of not having my car, but it was immature. I just didn’t know what else to do and I was sick of begging him for something, anything to keep me holding on. I went inside his house, went to the bathroom and cleaned myself up and waited. I sat there for fifteen minutes. The walk itself took me over half an hour then waited another fifteen so that if he came home we could sit down and discuss this like adults. He never showed up. I walked out of his house, got in my car and pathetically cried the whole way home. When I arrived at home my children were there with open arms as I walked in, soaked and chilled to the bone, back achy from the walk in the heels and feeling like a huge disappointment to just about everyone. Why wasn’t I enough? Why wasn’t my efforts, my attention, my love enough to get him to give me his freely in return. It wasn’t because of work, it wasn’t because of depression, I don’t know what it was, but he was holding on to his love like a mid-century virgin. Like an old lady who holds her purse on the bus. Like Julio Jones holds the ball during a touchdown. There was no way in hell I was getting any of it. And I couldn’t wait any longer. My point being, what was it I was actually waiting for? For him to realize he loved me? For him to realize he wanted me? For him to realize that he was losing the best thing he ever had one day at a time. Over those eight weeks, while I was slapped in the face with rejection time and time again while I begged and pleaded and asked and offered what I could, I realized that I wasn’t really waiting at all. I was getting over him, one day at a time, for eight weeks. I guess that’s what made breaking up so easy to do at that point. I no longer had to worry about how he was feeling, I was thinking about what I deserved. And I deserved more. I needed more and accepting less would have made me miserable. And trying to force him to be what I needed wasn’t fair either. Why is it that we fall for the person we are shown and then over time all that we fell in love with are the very things that we end up hating, wanting to change, not being able to live with? I was changing. Maybe that was the problem. Maybe I got into things with Serendipity too quickly, before I put the work in. Before I knew myself enough to say this isn’t for me way before putting out so much effort. Had I known myself better, listened to myself more, got in tuned with what my gut was telling me, maybe I would have said from the get go that I wasn’t ready. They say timing is everything, but what if it’s not only timing of meeting the right person, but being the right person? I was so much better at realizing what wasn’t working for me, but I still hadn’t realized my worth. I was worth him taking the time for me, for us. I was worth being loved and cherished and appreciated. I was worth it. And he didn’t know it. And I walked out. And now that was that. He didn’t come after me. He didn’t come to get the girl as I did to get him when I went to Florida. He didn’t ride in on his horse and beg me not to leave him. He didn’t actually do anything. About a week went by and I received an email. An email. Kinda like when Carrie gets broken up with on a post it note. The email said he didn’t understand why I left and wasn’t sure what to say, but that he felt he hadn’t done anything to warrant such behavior. So therein lies the problem. Yes, my behavior for leaving the bar that night was wrong, but how do you not see, how do you not hold yourself accountable for letting us slip away? And why on earth is it always about fault? 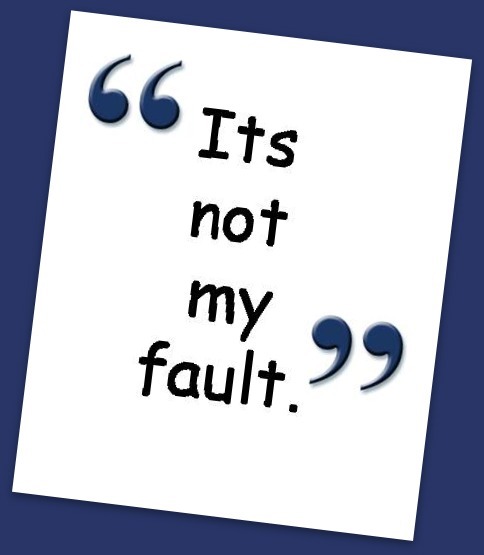 You need it to be my fault? Fine. It’s my fault. It’s my fault you never made time for me, it’s my fault you weren’t attracted to me, it’s my fault you couldn’t show me the love you claimed you had for me. If it makes you feel better, your job, depression, family issues, friendships and all your past relationships that didn’t work are ALL MY FAULT. Now that we got that out of the way……now what?